This article is about the city. For the television series, see Dallas (TV series). 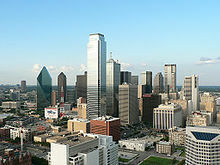 Dallas is a large city in the northern part of the U.S. of Texas. It is a part of a much larger group of cities called the Metroplex, along with important cities like Arlington, Denton, Fort Worth, and Plano. The city is one of the largest in the United States. For many years, the city was known as the city in which President John F. Kennedy was killed, but that is not associated with the city as much anymore. The city is home to the Dallas Cowboys, a professional American football team. The city is also home to the Dallas Stars, a hockey team in the NHL, the Texas Rangers, a baseball team in the MLB, and the Dallas Mavericks, a basketball team in the NBA. The city of Dallas was started in 1841 by John Neely Bryan. Over time, it grew into a large city with many companies. In 1915, Southern Methodist University opened in Dallas. On November 22, 1963, President John F. Kennedy was shot dead. In 2014, ebola virus infected several people in Dallas, killing some. A nurse who got it sued the hospital and got some money. On July 7, 2016, five police officers were shot dead. Dallas has a humid subtropical climate (Cfa in the Koeppen climate classification).